Preheat oven to 375°F. Saute onions and garlic in olive oil on medium heat until tender, 5 to 6 minutes. Cool slightly. In large mixing bowl, combine the cooled onion and garlic with the next six ingredients listed. Shape mixture into a volcano, including the center indentation. Place volcano into a foil pan and fill center indentation with Kraft Shredded Cheddar Cheese. Bake the volcano for 45 minutes to 1 hour or until meat thermometer inserted at thickest part registers 160°F and cheese 'lava' has begun to erupt down the sides of the volcano. While volcano is baking, prepare angel hair pasta and pasta sauce per package directions. 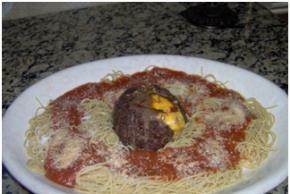 To serve, place erupting volcano in the center of a serving dish and surround it with cooked pasta. Spread the pasta sauce over pasta and then sprinkle the sauce with shredded parmesan cheese. Slice the volcano into 6 wedges and serve along with pasta.